Last week, when I hit up my monthly run to Whole Foods, I saw some beautiful looking salmon at the Fish Counter and I just couldn’t resist. I have never made salmon at home before or really any kind of fish. I don’t make fish because my Husband the Fisherman doesn’t like fish, except for the kind that is beer battered and fried or baked fish sticks. I figured if he had his steak, I could have a nice piece of salmon. Being the first time ever making salmon I wasn’t sure how to make it, but the butcher at Whole Foods told me I should grill if for just a few minutes and it would turn out perfect. So I thought why not give it a try? I have to say to cook fish on the grill was very easy. It only took about 6 minutes to make. Now that makes a nice quick dish. The butcher said to cook the side without the skin for one minute so I had some grill marks then cook the other side until you can insert a fork easily and the skin starts to flake. Perfecto! Of course I needed a glaze to go over the top of the salmon, so I thought how about a nice maple syrup and mustard glaze? It was sweet and savory. Perfect combination to go with my microwave sweet potatoes. 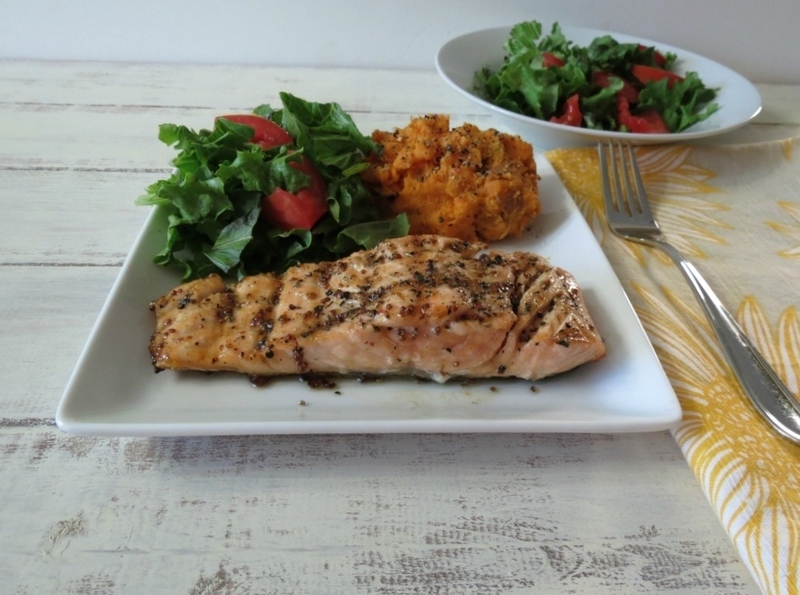 When making this recipe, I never looked at the calorie count for salmon, I know it’s healthy for you, so I cooked up the 6 oz that I had, coming to find out a serving size is 3 oz. Opps! I don’t mind, it was good, it filled me honestly I didn’t think 6 oz seemed like that much. So when you see the calorie count, it’s kind of high, but after all it’s 2 servings, even though I calculated it for one, since that’s what I ate. You’ll have to forgive the photos. I have a hard time plating meat for some reason. I’m actually surprised how nice the coloring came out. I have made the most fabulous pork dish twice in the past two weeks, and the photos are just horrible, so it hasn’t made it to my blog and my Husband keeps asking, why haven’t you posted the recipe? I keep telling everyone about it. It’s because my pork looks gray or not very appetizing. I just hate that. You work so hard to make the best meal and to make something I think you would like and then the photos look like poo! So disappointing. But I’m sharing you the salmon pictures because, it’s that good!! Plus the salmon looks great, I just plated it kind of weird. But at least you get to see what kind of meal I ate. 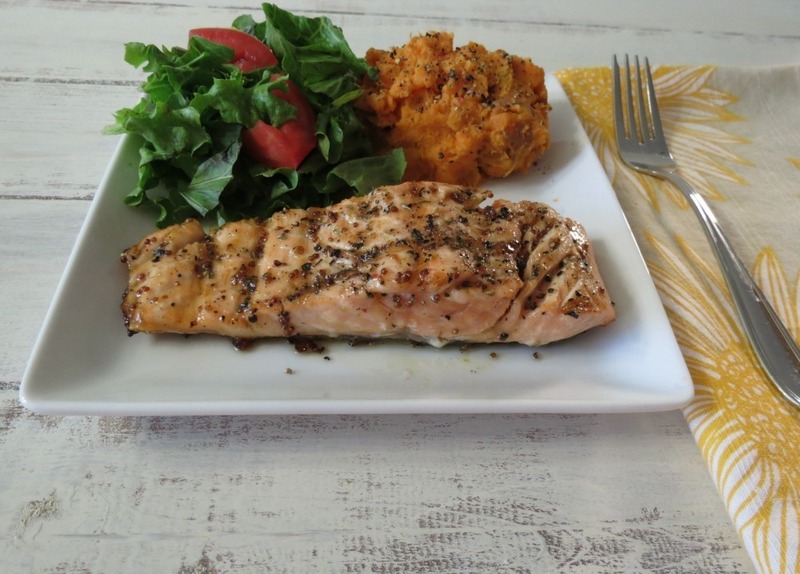 A healthy grilled fish topped with a maple syrup and mustard glaze. Brush grill with olive oil and set to medium heat. In a small bowl, add maple syrup, mustard, thyme and pepper; mix well; set a side. Sprinkle both the sides of the salmon with ground pepper (just a light dusting). Place salmon on the grill. 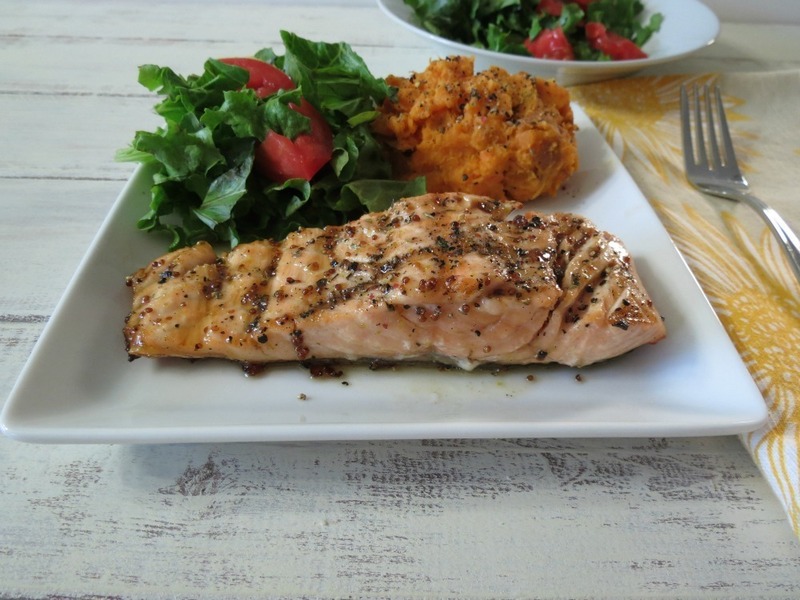 If salmon has skin, cook with skin side up for 1 minutes, just to get grill marks on salmon. Then flip salmon and cook for about 5 - 7 minutes, until the flesh starts to flake easily when tested with a fork or until desired degree of doneness. Brush the salmon with maple glaze and serve immediately. I really enjoyed having my salmon for dinner. My Husband can’t believe that I ate fish. I was always really picky about fish, but the past couple of years I have grown to like it. 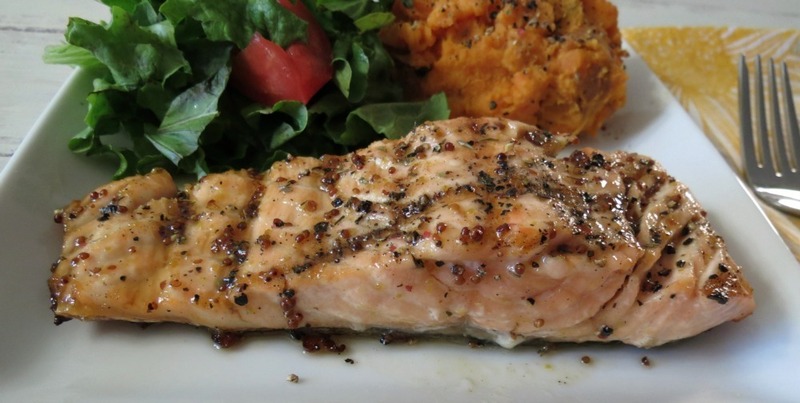 Salmon is an easy and tasty dish that I can’t wait to make again. What is your favorite kind of fish to make at home? 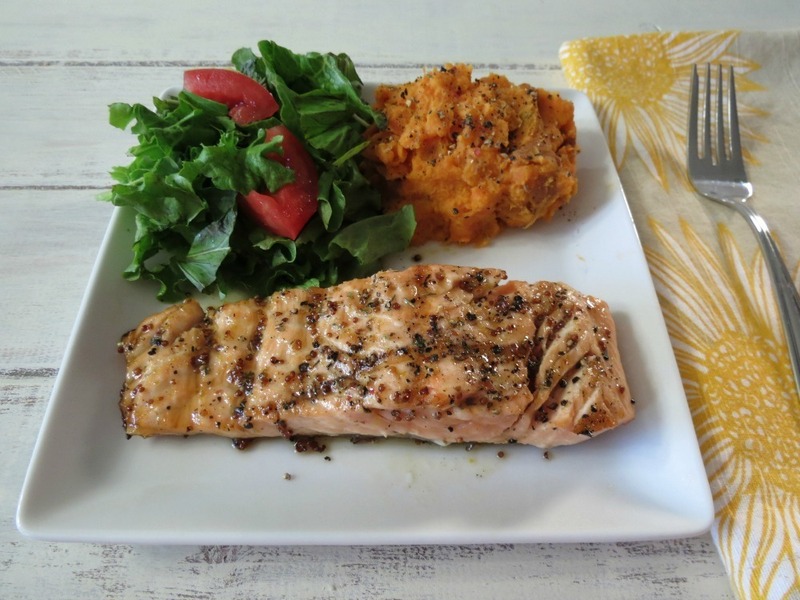 Salmon is the only fish I still eat…it has such great flavor! 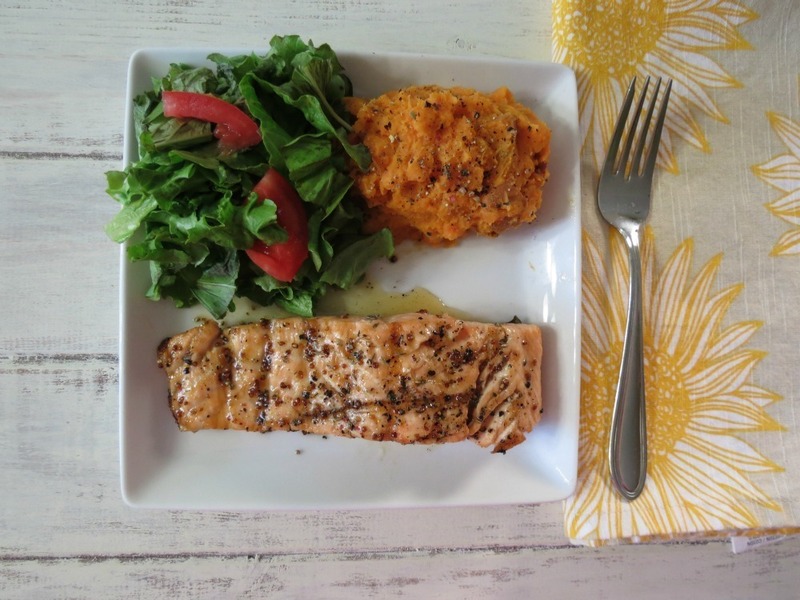 Love that maple mustard glaze you put on top…the perfect flavor combo for salmon!! Salmon is actually one of my favorite foods, believe it or not. But my husband doesn’t like the smell of salmon cooking so I’m not allowed to make it in the house when he’s home. This is the one reason I look forward to him going on his golf trips…I get to make salmon for dinner. This recipe looks great. I will put it on my “recipes to try” list for future use. This looks delicious!! We are always looking for new ways to cook salmon! Hope you check out our blog. YUM! I love salmon and mustard and maple are two of my favorite flavors. This looks like a perfect dinner! Thanks for sharing! Thanks Marie! Crazy how mustard and maple syrup go so nicely together! A good salmon dinner is the best. Love the ingredients you used. I also like your addition of thyme to the recipe Jennifer. Looks and I am sure tastes absolutely delicous! Wow, your salmon came out just beautiful! It looks as if it was served at a gourmet restaurant! Nice job!! You are too sweet! Thank you Kristi!